The title of this blog post may look like a bunch of gibberish to you so I’ll try to break it down. PopCult is a collective of ComiCulture entrepreneurs who specialties in publishing, video games, music, film and television. Last year they threw a big PopCultour party at the San Diego Comic-Con. 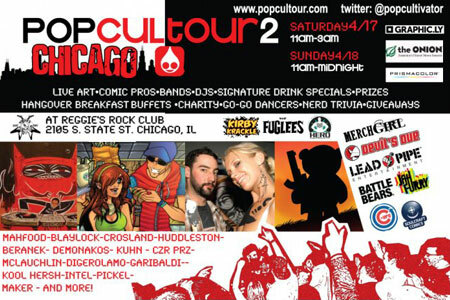 Well, this year marks the beginning of Chicago’s annual C2E2 (Chicago Comic & Entertainment Expo) and PopCult is hosting events all weekend at Reggie’s Rock Club, just a few blocks from the convention center. It’s PopCultour 2! Get it? Posted in Popcult, VideoTagged Abstract Artimus, Black Phoenix Alchemy Lab, C2E2, Chicago, comics, Daikaiju, Dave Crosland, DJ Intel, Hero Initiative, Jim Mahfood, Joe Quesada, Jose G, Kirby Krackle, Kool Hersh, Maker, Mike Huddleston, Pickel, Popcult, Popcultour, Reggie's Rock Club, Shojo Showgirls, The FugleesBookmark the permalink.